As the 2019 elections draw closer, those seeking elective positions have commenced wider consultations and strategic contacts to win delegates to the Primaries and supporters for the main elections. One of the gubernatorial hopefuls and strongest aspirants of the PDP in Plateau State, Rt. Hon. George Edwards Daika who was Speaker Plateau State House of Assembly when Nigeria returned to democracy in 1999 and then Member of representatives Shendam/Mikang/Qua'anpan Federal Constituency from 2003-2007, Rt. Hon. 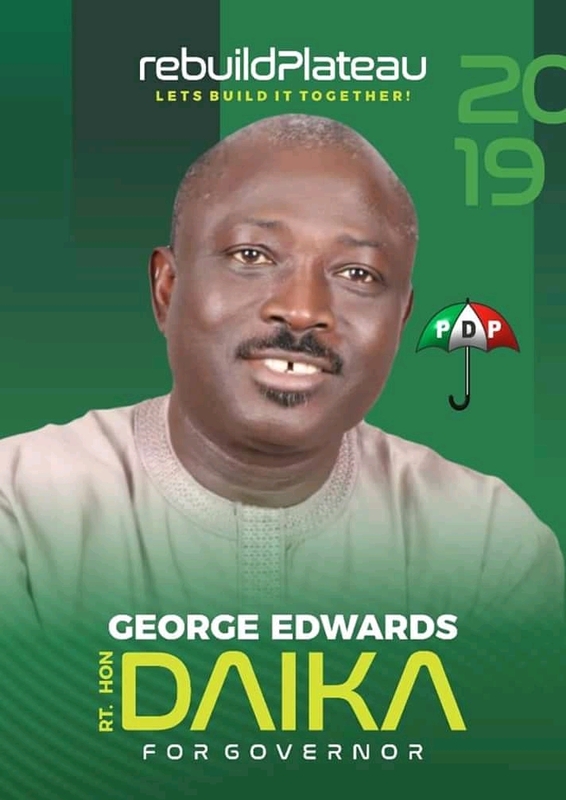 George Edwards Daika has commenced meet-the-delegates tour to further solidify his support across the Seventeen Local Government Areas of the State. Local Government Areas visited were Mikang, Shendam and Qua'anpan LGAs. The tour started in his Local Government, Milan with a visit to the Traditional Ruler and Chairman Mikang Traditional Council Long Tehl HRH Miskaam Barr. Donald Puntel to seek royal blessings. The Rt. Hon. George Daika campaign directorate led by its Director General, Dr. Sam Godong was warmly received by the royal father who wished the Aspirant luck. The delegates in Mikang LGA eulogised Rt. Hon. Daika, saying he has assisted them in diverse ways and brought development to the area while he held sway as Speaker and House of Representatives Member. They said he has been supportive of the party and believe he would do more if he becomes Governor of the State. In Shendam Local Government, the Campaign Team visited the Long Ga'mai of Shendam, HRH Miskoom Martin Mudu'utrie Shaldas III to seek royal blessings before proceeding to meet the party Executives. The Traditional Ruler admonished Rt. Hon. George Daika to preach peace and uphold same all through the tour. He wished him the best in his aspiration. The Party Executives in Shendam LGA warmly received the campaign team. They said Rt. Hon. Daika is their Son and has delivered dividends of democracy to them when he served them at the House of Representatives. In Qua'anpan LGA, the story was no different as the campaign team paid courtesy visit to the Traditional Ruler of Qua'anpan LGA the Long Pan, HRH Nda Emmanuel Dabang. The Royal Father warmly received the campaign team and call on the Aspirant, Hon. George Daika who he called his son to put God first in the aspiration. He said the Aspirant has impacted the LGA positively when he represented them at the National Assembly as his projects are still visible and wish him luck. In Qua'anpan LGA, the Party Executives said Rt Hon. George Daika is "Amana" meaning a "Promise Keeper"
They said they are still drinking from the Water he brought to them. The Director General of the Campaign Organisation, Da Samuel Godongs who spoke at all the meetings said Rt. Hon. George Daika remains the best Aspirant in PDP and in the State. He said the Aspirant is bold, fearless and a purpose-driven person. He went further to posit that Rt. Hon George Daika would bring about the much needed transformation and unity amongst the diverse groups in Plateau State. Da Sam Godongs said with the wide acceptability of Rt. Hon. George Daika across the 17 LGAs, he is convinced he would emerge victorious as the Party Candidate and become Governor to bring Plateau State out of the hardships being experienced and the infrastructural deficit the APC-led government has plunged Plateau State into. Chairman of the Advisory Board of the Campaign Organisation and Former Chairman Pankshin LGC, chief Simon Tangni said they have seen in Rt. Hon. Daika the qualities required to move Plateau State to enviable height as Governor of Plateau State. He said Rt. Hon. George Daika is man of integrity and someone with a great heart. In all the Local Government Areas visited the Aspirant, Rt. Hon. Daika said he is in the race for Governorship to bring about immense transformation and change the fortune of the State. He said he would pursue unity and entrench good governance in the State. He promised to carry all people along irrespective of ethnic, tribal, religious and political inclinations if elected as Governor. He said Plateau State is far behind and not where it should putting into account the infrastructural development the former administration of Sen. Jonah David Jang brought to the State. He said the agenda is to have Plateau State far above where it is today, but the lack of vision and purpose of the present government have greatly affected the State.